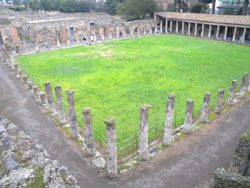 In the latter years of Pompeii the four-sided colonnade rising up behind the Theatre was used as the barracks of the organisation of gladiators who performed in the town. Along the wings of the colonnade and on the first floor were the rooms which provided accommodation for the gladiators from other towns. Paraments, helmets and arms belonging to the gladiators were found in many of the rooms. The four-sided colonnade with its 74 Doric columns was originally used as an extension of the theatre: for example, the public could go there for something to eat (performances often lasted most of the day) or to take shelter from the rain. It is likely that for a few years this space was used both by the theatre and as the headquarters of an organisation responsible for the sporting, intellectual and military training of the town’s youth.